The Christys are listed in the Sun Fire Office records as insuring property in Gracechurch Street, but also in Nag’s Head Court where they apparently had a warehouse. They also insured property in Bermondsey Street where one Charles Birt, a baker, is listed as the occupant. Thomas’s son, Thomas junior, is apprenticed to his father in 1815 and later becomes a partner. In 1830, one of the young porters employed by the Christys embezzled some funds. He went round to customers of Christy & Co. for the payment of bills owed, but he failed to hand in the money to his employers’ clerk. He was sentenced at the Old Bailey to fourteen years transportation and was shipped out to New South Wales. 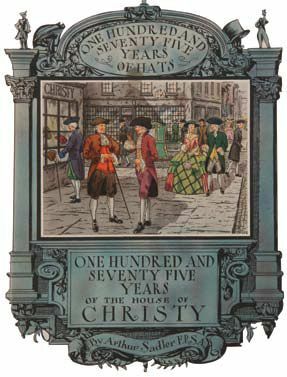 (3) At the end of December 1830, Thomas Christy senior retired(4) and the firm was henceforth usually referred to as Messrs Christy & Co. Son Henry died in 1865 of inflammation of the lungs and his probate record lists Joseph Fell Christy of 35 Gracechurch Street as his brother and one of the executors. 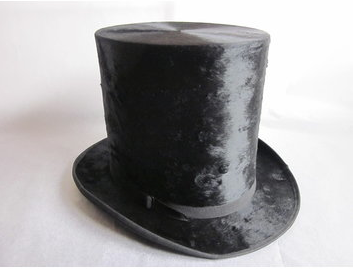 (7) Although Henry had been a partner in the hat-making business, he is also credited with inventing the penny receipt stamp, and he was director of the London Joint-Stock Bank as well as an amateur ethnologist. His interest in primitive societies and his funding led, after his death, to the discovery of Cro-Magnon man. 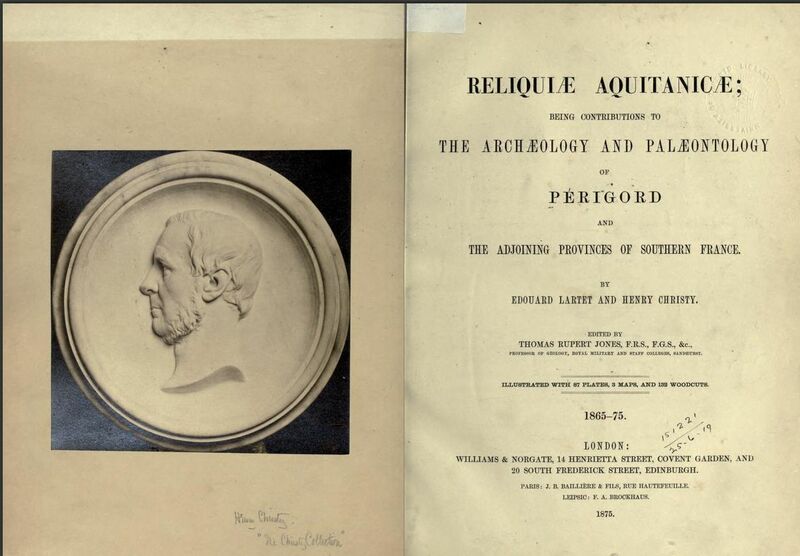 He also left a half-finished book, entitled Reliquiae Aquitanicae, being contributions to the Archaeology and Paleontology of Périgord and the adjacent provinces of Southern France, completed at the behest of Christy’s executors, first by Edouard Lartet and, after his death in 1870, by Thomas Rupert Jones. For more on Henry Christy, see here. George Dodd, in his Days at the Factories (1843) tells us more about the Bermondsey manufacturing department. According to Dodd, it was reported to be the largest in the world and consisted of two “extensive ranges of buildings on opposite sides of Bermondsey Street”. The steam engine required a chimney of a hundred and sixty feet and the whole complex consisted of a great number of individual departments, such as one for trimmers, one for packers, one for the turners and even a blacksmith’s shop, not to mention the storerooms required. The different kinds of hats, be they silk or beaver, were made in different sections of the building and Dodd goes to great lengths to describe the various processes necessary in making hats, which I will not repeat as you can read the whole story here. But hats were not the only item produced by Christy’s. While Henry was travelling in Istanbul, he noticed the looped pile cotton fabric we now know as terry-cloth. The company developed a machine to make the looped pile and the first efforts, still under the name of ‘Turkish bath towel’, were shown at the Great Exhibition. The towel production continues till this day and you can see the purple and green variety every year at the Wimbledon Championships (their website for the towel business www.christy.co.uk). The Gracechurch and Bermondsey properties were let go in the 1950s, but Christy’s still produce stylish quality hats as well as the helmets for the Metropolitan Police force (their website for the hat business www.christys-hats.com). And should you be interested in researching the history of the business, you need to go to the John Rylands University Library in Manchester where they keep the papers of W.M. Christy & Sons (see here). (2) The London Gazette, 9 October 1804. (3) Old Bailey case t18300527-19. (4) The London Gazette, 28 December 1830. (5) The London Gazette, 18 July 1845. (6) England & Wales, National Probate Calendar (Index of Wills and Administrations), 1858. (7) England & Wales, National Probate Calendar (Index of Wills and Administrations), 1865. Value of the estate £60,000. Kent’s 1794 Directory of London and Westminster & Borough of Southwark lists Dunford, Baratty & Son, pin makers, at 36 Gracechurch Street, but the Dunfords had plied their trade for a lot longer, as from Christmas 1744, a house on London Bridge was leased to a Mr. Durnford, pin maker. Not much else is known, other than that the house had a frontage of 16ft 8in.(1). 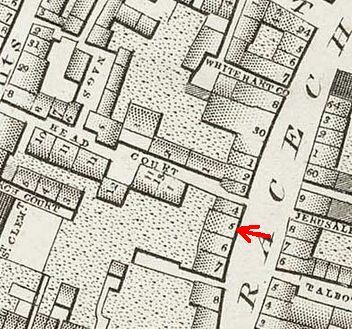 Kent’s Directory of 1766 already puts Richard Durnford, pin-maker, in Gracechurch Street, but no house number is given. The 1768 edition, however, lists R. Durnford at number 36. In 1808, Edward Francis and George Madgwick Davidson of 36 Grace Church Street, pin and needle makers, take out an insurance with the Sun Fire Office, suggesting that Durnford had disappeared from the premises. A year later, an entry in The Repertory of Arts and Manufacture, records that Messrs. Francis and Davidson have purchased a patent from one William Bundy for heading pins and the entry helpfully lists them “late Durnford and Co”. 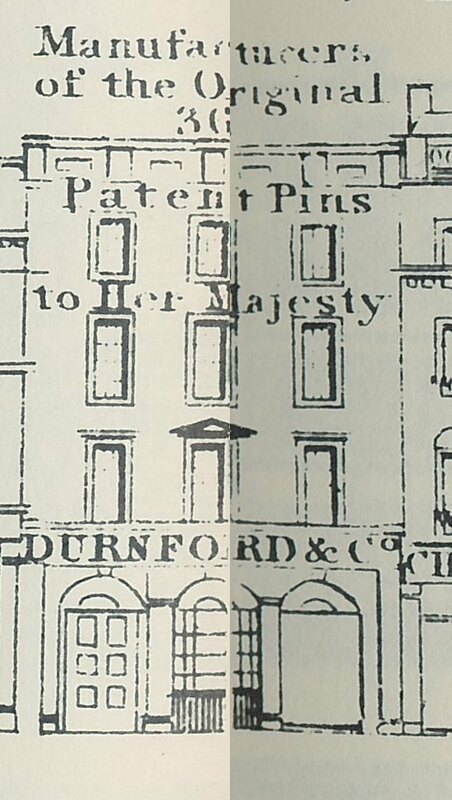 However, when Tallis came round in 1839 or 1840 for his Street Views, the firm was still called Durnford and Co, so what is going on? In 1819, The Cyclopaedia, or Universal Dictionary of Arts, Sciences, and Literature reports on a useful new way of heading pins, which made for a speedier process and more uniform heads. The Cyclopaedia is not at liberty to disclose the actual process, so we are none the wiser, but they do mention the inventors as Messrs Durnford, Francis & Co. which at least gives us a link between Francis and Durnford. The Naturalist of 1838 gives hints to entomologists on pinning their insects and tells their young readers that “Swedish and Russian pins are the best made” and “the heads of the small English pins are very liable to come off (and then the insect runs great risk of being spoiled)”. That problem can be solved by heating the pin head and dipping it in sealing wax, but “silver pins should be used for those [insects] liable to grease. The makers are Durnford, 36, Gracechurch Street, and Hales, 15, Great Dover Street, Southwark”. Despite this 1838 mention of Durnford, an 1820 insurance record just lists the names of Francis and Davidson. The two gentlemen were doubly related as George Madgwick Davidson had married Elizabeth Francis in 1809; Edward Francis was her brother who had married Susanna Davidson, George Madgwick’s sister, also in 1809. And they were not just involved in pin making as in September 1831, they dissolve a partnership that they had in Nag’s Head Court, just around the corner of their pin making business in Gracechurch Street, with Edward’s brother, William Francis, as wholesale tea-dealers, saltpetre and hop merchants, under the name of Francis and Co.(2) They seem to have been busy people. George Madgwick did very well out of all his businesses and was listed as a landed proprietor in the 1851 census. 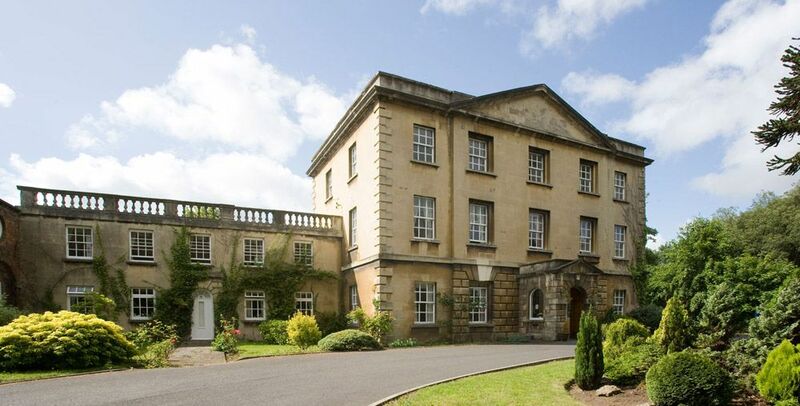 He died that same year at Warmley House (listed building, see here) and was buried “by coroners’ order” on 19 July. Son Alfred succeeded to his father’s pin-making factory at Warmley, which had been set up in the 18th century by William Champion. (4) Alfred expanded the business to include the Warmley Tower Potteries, but, in 1863, after the death of his wife, he emigrated to Australia. He was described as “a persistent and passionate advocate for justice for the aborigines” and “an unrelenting opponent of the Pacific Island labour trade.” More on him here. The shop at 36 Gracechurch Street narrowly escaped being requisitioned for the road works that were necessary because of the new approach to London Bridge. 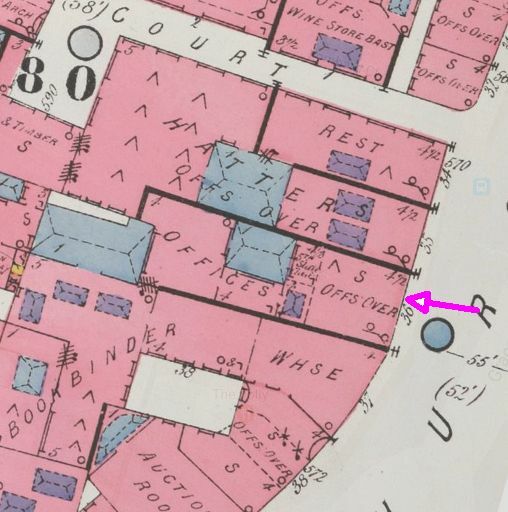 On the 1887 insurance map you can see that number 36 kept its straight facade onto Gracechurch Street, but number 37 and higher numbers were set back. In the 1833 tax records, the property of Davidson & Francis’s neighbour, Henry Blenkinsop, at number 37, is listed as having “late Naish & Blenkinsop” as occupiers and the “New London Bridge Company” as owner. 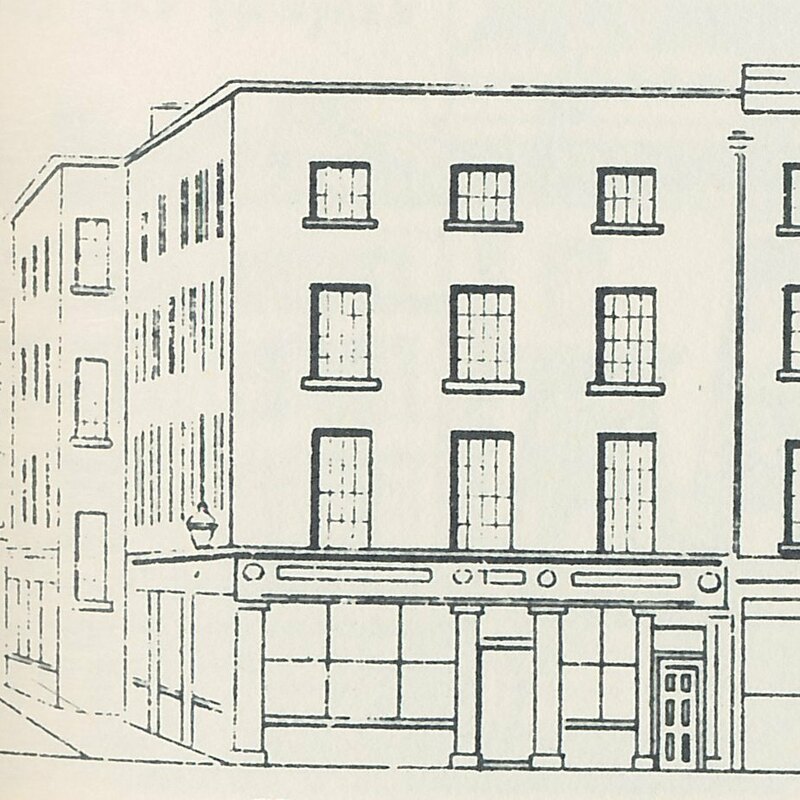 The Durnford pin shop seems to have been abandoned in the early 1840s as the 1843 Post Office Directory fails to list them and although the 1844 land tax records still list Francis & Davidson there, by 1847 they have gone (the records for 1845 and 1846 do not seem to be available online). 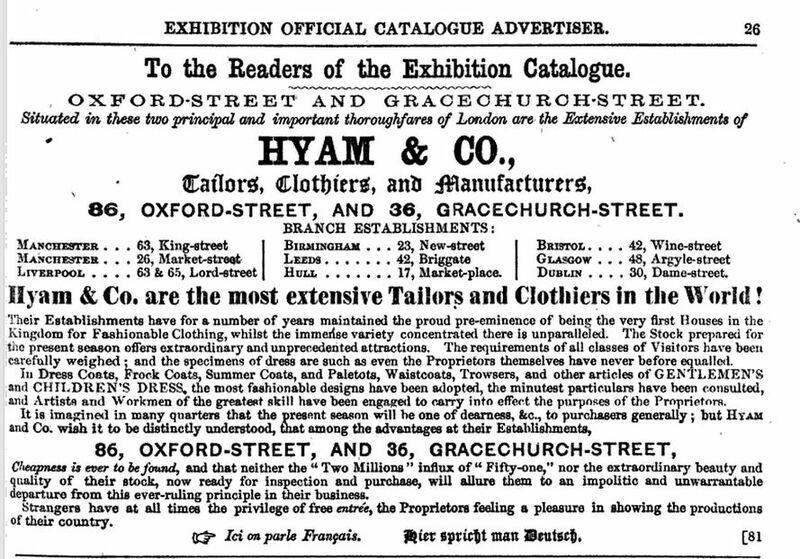 The 1848 Post Office Directory shows Lawrence Hyam, tailor, draper, outfitter, hosier, hatter & warehouseman on the premises. (2) The London Gazette, 20 September 1831. (3) The Old Bailey, case t18410201-678. The first time we hear about a Wilcoxon in the Fish Street area is in 1836, when Robert Wilcoxon insures premises at 1 Monument Yard with the Sun Fire Office as wholesale looking glass manufacturer. That same year, the tax records show “Wilcoxon & Harding” for a property at Fish Street Hill. 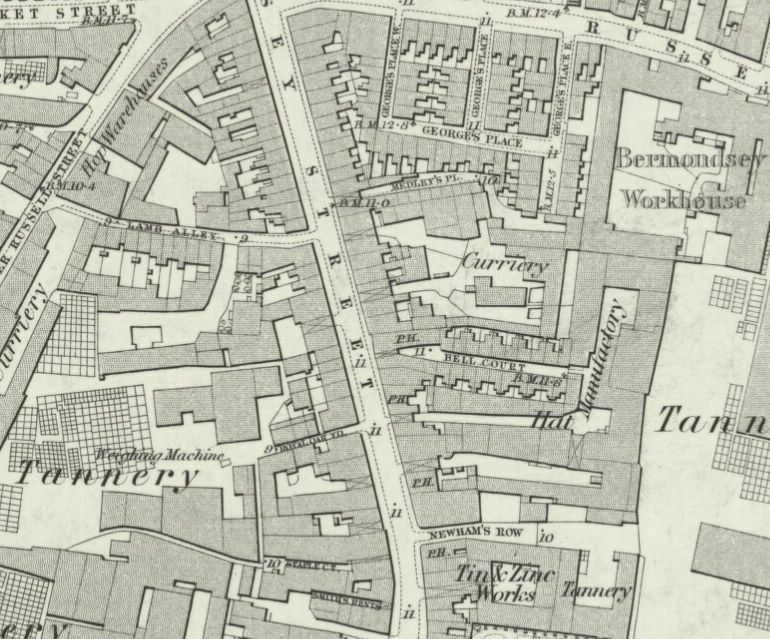 The confusing thing about having the corner shop is that most of the time it was referred to as 1 Monument Yard (these days Monument Square), but occassionally, as Tallis did, it would be listed as 40 Fish Street Hill. As we can see from the 1799 Horwood map, it was quite a substantial building. Although the firm started out as looking glass manufacturers, they branched out into all kinds of goods that could broadly be described as house furnishings. In 1840, for instance, they registered a design for stained paper hangings. (5) And on the indenture for the next generation, Arthur III, the son of Robert, Arthur II is described as upholsterer, cabinet-maker and plate glass manufacturer. And in 1857, Wilcoxon & Co. brought out a booklet with their designs for furniture. Unfortunately Google Books does not show the content, so I cannot give you any examples. 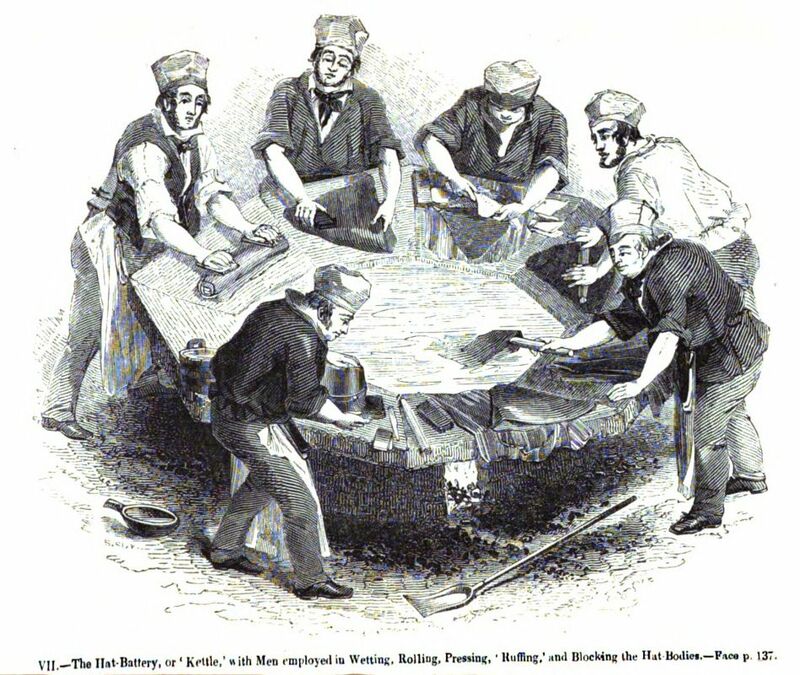 When Robert died in 1866, his sons Arthur and Charles were given as two of the executors, both with the address 1 Monument Yard and both with the job description “upholsterer cabinet and looking-glass manufacturer”. In 1868, a patent is given to James Watson, foreman to Messrs. A. & R. Wilcoxon, of Newington Causeway for the invention of “an improvement in the manufacture of wall papers, and in apparatus used in such manufacture”. 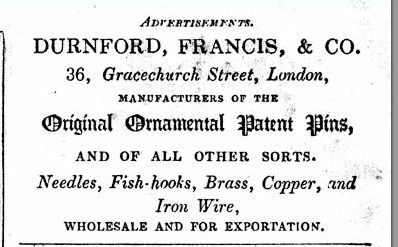 (6) The description does not tell us much about the invention, but it does tell us that the firm must have branched out across the Thames. And indeed, a notice in The London Gazette of 11 April 1876, tells us that the partnership existing between Arthur II, Arthur III, Charles Wilcoxon and Frederick George Wilkinson (the third executor of Robert’s will and described as accountant) of 1 Monument Yard and 17 Newington Causeway is to be dissolved by order of a decree of the High Court of Chancery in the case Wilcoxon v. Wilkinson. Well, well, the Wilcoxons seem to have fallen out with their accountant. Arthur II died in 1878(7) and the business seemed to have been split up after that. 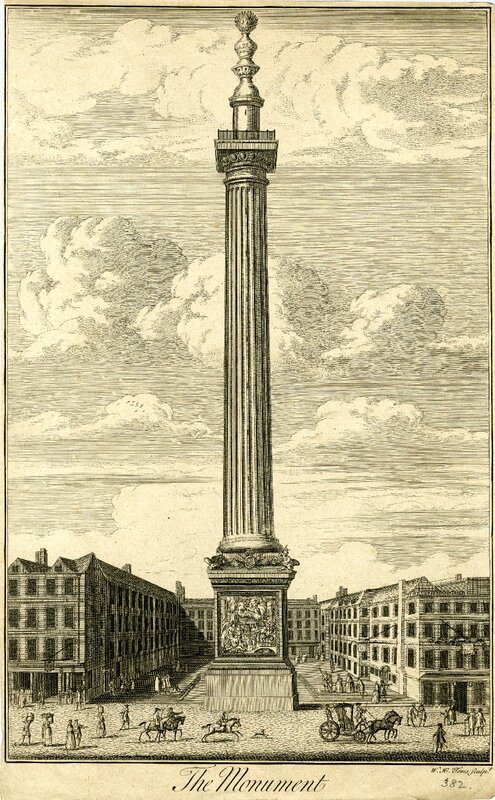 Arthur III moved the Monument Yard business to 153, 154 and 156 Queen Victoria Street, but went into liquidation in 1881. (8) In The Truth, G.M. and H.J. 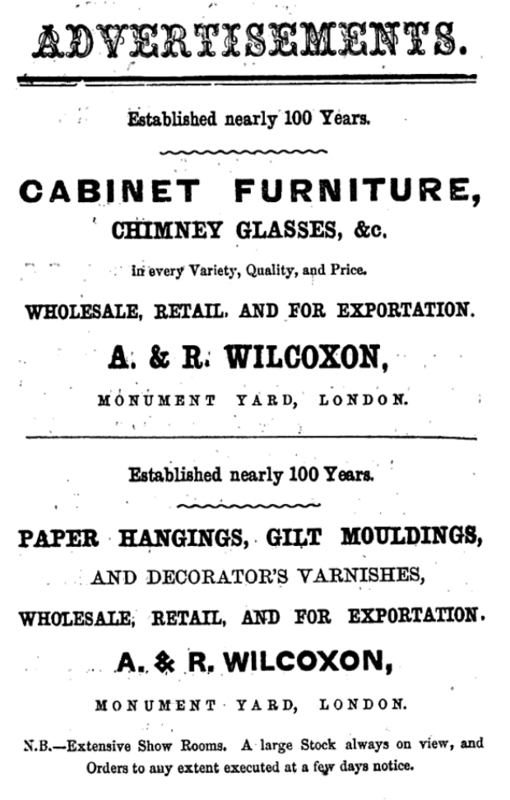 Story announce that they have taken over “the old-established cabinet & upholstery business of A. and R. Wilcoxon, late of Monument-yard” and that they have removed the whole business from Queen Victoria Street to their premises at Coleman Street and London Wall. And that was the end of the Monument Yard branch. Charles and a new partner, Frank Robson, continued the paper staining business at 17 Newington Causeway, but the partnership was dissolved in 1886 with Robson to continue the business under the old name of Wilcoxon & Co.(9) Not much more can be found on Robson, so I am afraid that was the end of the Newington Causeway branch as well. (2) The London Gazette, 6 April 1824. (3) The London Gazette, 26 February 1839. (4) One of the salesman, John Robert Cuffley, can be traced to Great Yarmouth where he stayed a few days in July 1847 in the Angel Inn. He later had to give evidence in a case of election fraud (see here). On 27 december 1849, Arthur and Robert Wilcoxon attended a anniversary dinner of the Commercial Travellers’ School. Had Cuffley been a pupil at that school? 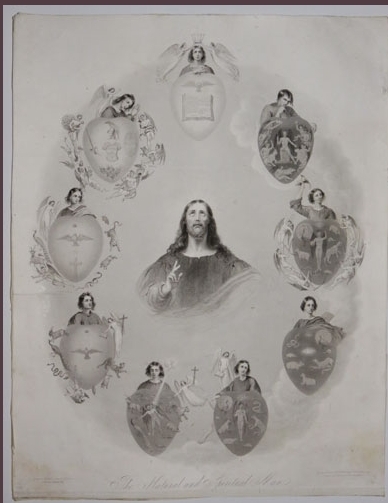 (5) Board of Trade, registered design 467 (National Archives BT 42/15/467), dated 13 November 1840. (6) The London Gazette, 23 October 1868. (7) England & Wales, National Probate Calendar (Index of Wills and Administrations), 1878. 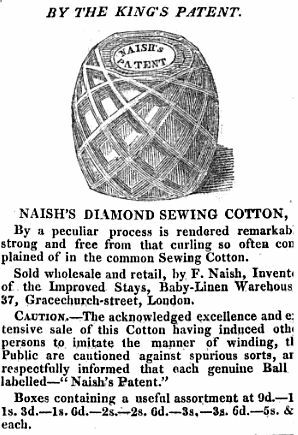 (8) The London Gazette, 22 July 1881. (9) The London Gazette, 22 June 1886. In 1838, Blenkinsop was the victim of some shoplifters. Three females entered the shop, pretending to be interested in Guernsey frocks. They were apparently not the type of customers Blenkinsop was used to in his shop as he stated that he said “I did not think I had any that would suit”, but when they insisted, he showed them the cheapest he could find. They decided “they would not do” and left the shop. Almost immediately Blenkinsop noticed some stockings missing from the window and he and his assistant gave chase. One of the girls, Sarah Young, quickly passed the stockings to an accomplice, Charles Hewitt, but Blenkinsop managed to apprehend them both. Young and Hewitt were found guilty and confined for three months. (6) A Guernsey frock, by the way, is not some sort of skirt, but a shirt or sweater based on the garments worn by Guernsey fisherman (see here for more information). Henry Blenkinsop was the son of Charles and Alice Blenkinsop of Heighington in the county of Durham, and was in his late thirties when he married Elizabeth Pryer, daughter of Nathaniel and Elizabeth Pryer of Walworth, St. Mary Newington, on the 28th day of the 8th month, 1827. The designation of the months by numerals was a Quaker practise and the event took place “in a public assembly of the people called Quakers, at Redcross Street, Southwark, in the county of Surrey”. (7) Three children were born to the couple: Erasmus (1-7-1828), Anna Maria (19-9-1829) and Ellen Elizabeth (24-6-1832). Unfortunately, little Erasmus died when only 9 months old, but the two girls survived and lived until they were 81 and 71 years old respectively (see below). The registrations of the births of the children were entered at the monthly Quaker meeting of Gracechurch Street. 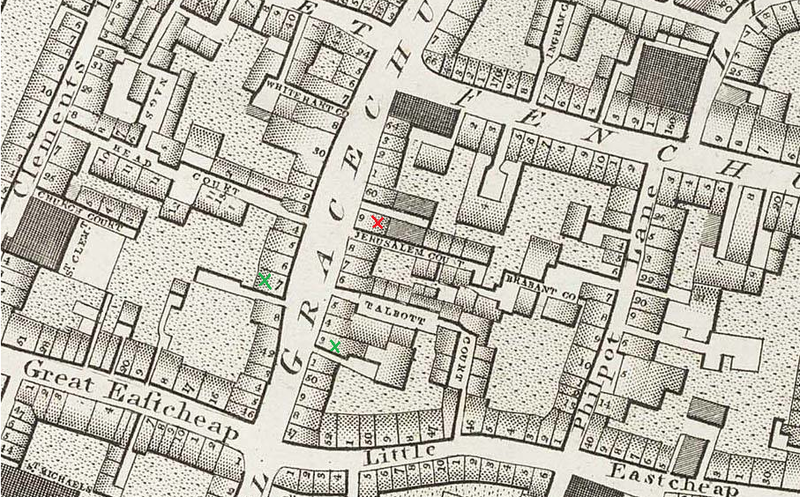 In all three cases the address is still given as 37 Gracechurch Street, so the move to the other side of the street must have occurred after June 1832. The 1841 census does not give a house number, but the 1851 census finds Henry and his two daughters at number 53. I have not found a record of his wife’s death, but Henry is listed as a widower. Anna Maria and Ellen Elizabeth are unmarried and were to remain single all their lives. Henry died on the 27th of March, 1854 “after a lingering and painful illness”. (8) The “hosiery and outfitting business” was disposed of(9) and at some point after the death of their father, the sisters moved to Saffron Walden where they started a private school, which they advertised in The British Friend of October 1863. The census records for 1861-1911 show them residing in Saffron Walden in the High Street at number 77. 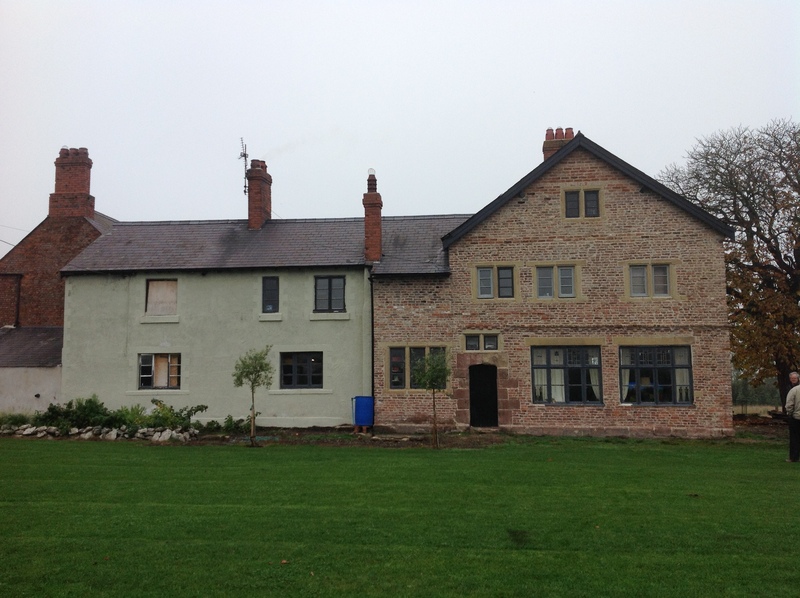 Ellen Elizabeth died on 16 November 1904 and Anna Maria on 14 August 1911; the probate records name the house as “The Gables”. The sisters were most likely buried in the Friends’ burial ground in Saffron Walden and with their deaths, the line of Henry Blenkinsop, hosier, died out. (1) House of Lords Journal, Volume 64 – 27 March 1832 (via British History Online). (2) Richard Thomson, Chronicles of London Bridge (1827). See also the blog post – with lots of pictures – by Georgian Gentleman on the shop at One London Bridge that had to be demolished for the new bridge. 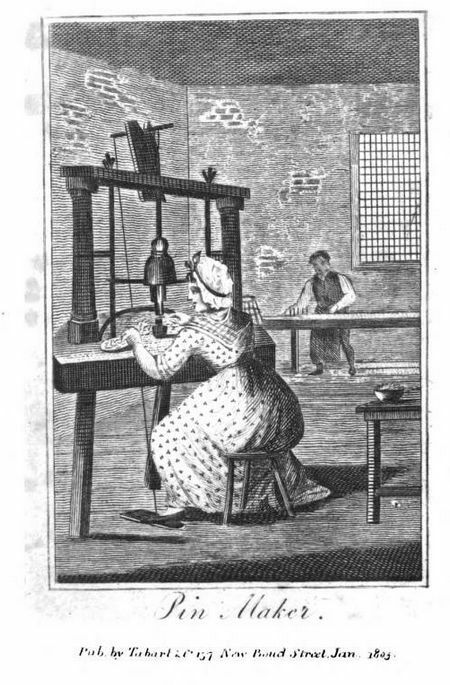 (3) La Belle assemblée: or, Bell’s court and fashionable magazine, 1 Oct. 1821. (4) William was born on 13 July 1806 (The National Archives; Kew, England; General Register Office: Society of Friends’ Registers, Notes and Certificates of Births, Marriages and Burials; Class: RG 6; Piece: 36: Monthly Meeting of Bristol: Births (1787-1837)) and married Sarah Hallam on 6 March 1832 in London (Idem, Piece: 539: [St John] Horsleydown and Southwark: Marriages (1795-1836)). (5) “Notice of expired patents” in The Repertory of Patent Inventions, vol. 13 (1832). (6) The National Archives; Kew, England; General Register Office: Society of Friends’ Registers, Notes and Certificates of Births, Marriages and Burials; Class: RG 6; Piece: 539: [St. John] Horsleydown and Southwark: Marriages (1795-1836). (7) Central Criminal Court. Minutes of Evidence (1838). (8) The British Friend, June 1854. (9) The British Friend, June 1854. 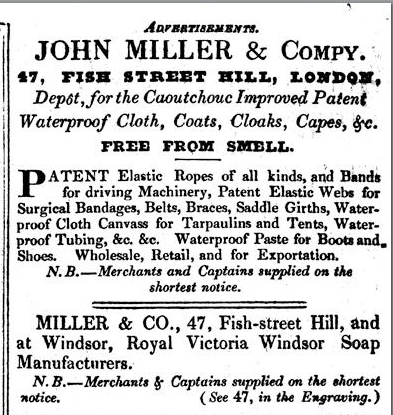 The Tallis Street View elevation shows J. Miller as the occupant of 47 Fish Street Hill where one could buy ‘improved patent waterproof coats &c’’. 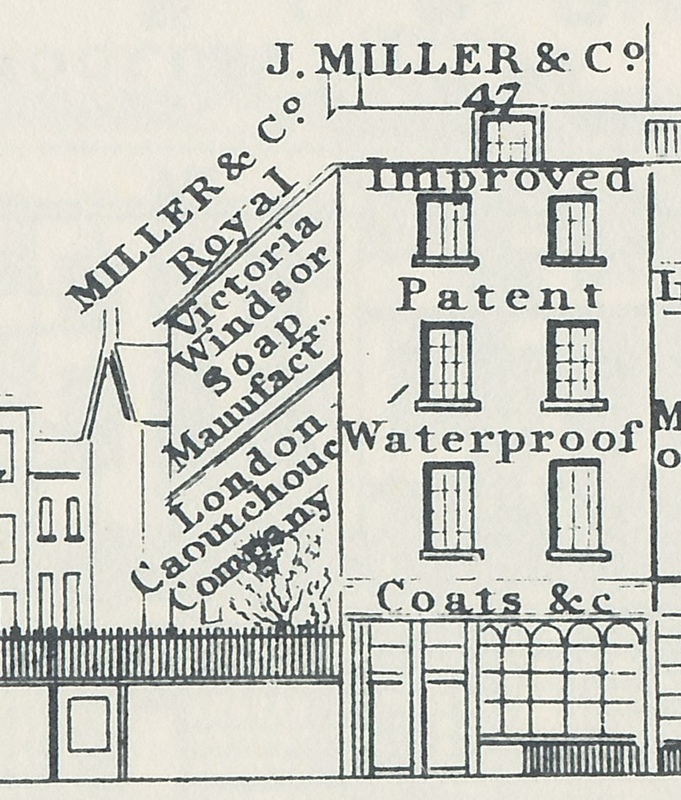 The side of the house also shows the names of two companies for whom Miller acted as agent: the ‘Royal Victoria Windsor Soap Manufacturer’ and the ‘London Caoutchouc Company’. Well, we all know what soap is, but what the heck is caoutchouc? It turns out to be an obsolete term for India rubber, derived from the French, who probably derived it from the Spanish cauchuc, who originally had it from the South America Indians who called it cahu chuc ‘weeping wood’. 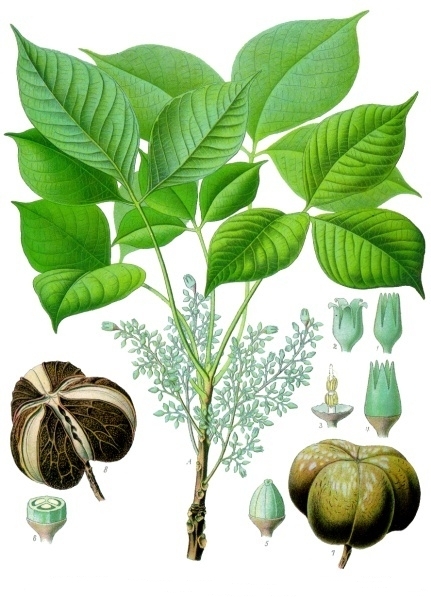 The rubber plant, Hevea Brasiliensis, is indigenous to South America, but is now grown all over the world in tropical regions. The French, by the way, still use the word caoutchouc for rubber. John Miller, formerly of 67, Thomas-street, Windsor, Berkshire, Brewer’s and Banker’s Clerk, and Proprietor of the Windsor Express Newspaper, Printer and Stationer, in partnership with Richard Oxley, at No. 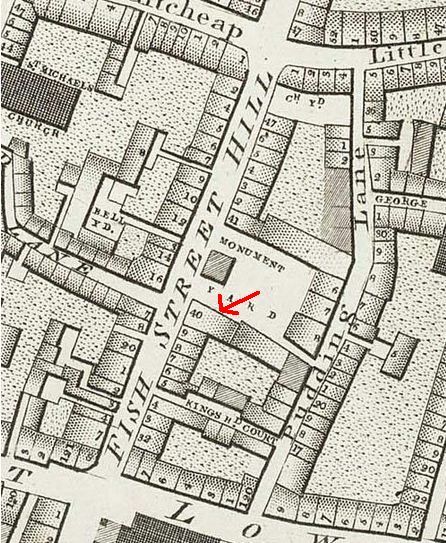 42, Thomas-street aforesaid, then of High-street, Windsor, Manager of Medley and Son’s Bank, then of Park-street, Windsor aforesaid, Agent to the Hope Insurance Office and Phoenix Office, then of 47, Fish-street-hill, London, Waterproof Coat Warehouseman, then of No. 23, Chadwell-street, Clerkenwell, Middlesex, exhibiting the Biophalax at the Egytian-hall, Piccadilly, then of No. 23, York-place, City-road, Middlesex, out of business, and late of No. 9, Bloomsbury-place, Brighton, Sussex, Lodging Housekeeper. Few of the jobs Miller had can be substantiated, but some observations may be in order to show that he was not the successful entrepreneur he appeared to be in the Street View elevation. The Windsor and Eton Express reported on 28 January, 1837 that “The inhabitants of the town and neighbourhood of Windsor were yesterday thrown into considerable consternation by the announcement that the bank of Messrs. Medley and Son, and Co., of this town, had stopped payment. The alarm, however as the day advanced, greatly subsided, as it became known that from the short period since its establishment – we believe about three years – its business as a bank of deposit was by no means of an extensive character, and also that of those who did bank there, very few indeed are likely to suffer to any material extent”. Miller cannot have been a very successful manager! I also doubt that Miller played a very important role in the ‘partnership’ between Oxley and himself for the Windsor Express newspaper as he is not mentioned in the Wikipedia page for the paper. They just mention the Oxley family who still owned the paper in 1910. I will look into the exhibiting of the biophalax when I write about the Egyptian Hall in one of the forthcoming entries on this blog, but as you can no doubt guess, the biophalax was not a very successful enterprise either. 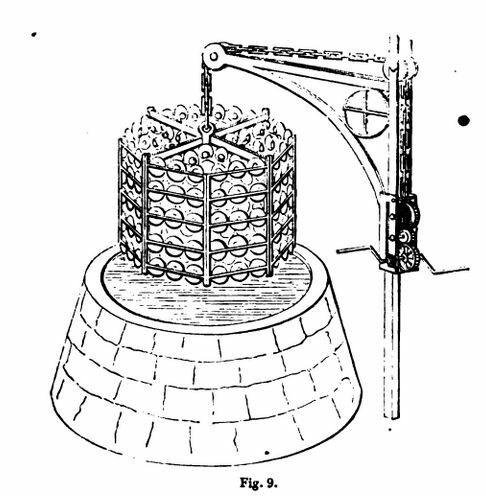 At the time of the LG bankruptcy entry, Miller is confined as a debtor in Horsham prison. (3) He must have been one of the last prisoners there, as the goal was closed and the building sold off and subsequently demolished in 1845. (4) I have not been able to find out whether Miller was at that time still an inmate or whether he had been releases beforehand. 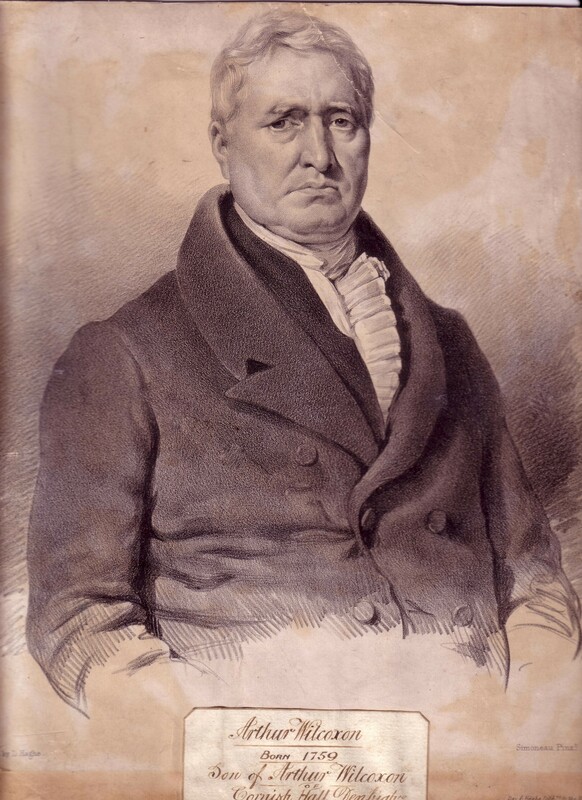 In fact, the further story of John Miller has proved elusive; having a common name like John Miller does not help either, so I must end the history of the caoutchouc salesman here. 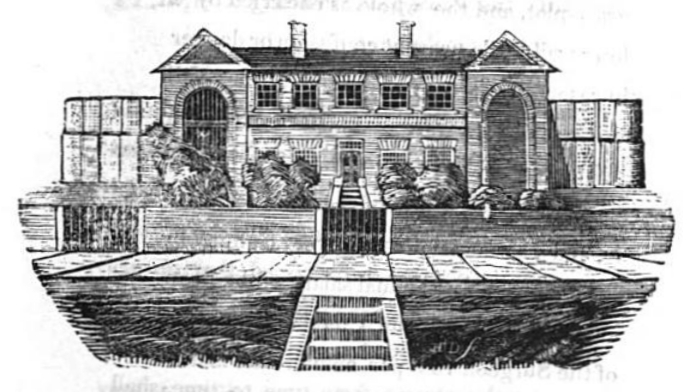 (1) For more information on the Tottenham factory and the goods they produced see: William Robinson, The History and Antiquities of the Parish of Tottenham, in the County of Middlesex, vol. 1 (1940), pp. 66-68 (online here). (2) C.G.F. Gore, The Sketch Book of Fashion, vol. 2 (1833), pp. 251-252. (3) London Gazette, 8 March 1844. (4) See: Ye Olde Sussex Pages, Horsham Goal.